If there is any flower out of all the flowers to ever crochet, the happiest of them all has to be the sunflower. The bright yellow is bound to brighten up anyone’s day. Sunflowers almost look like they are smiling at you with their arms open for a hug. Do you see it? Or is it just me? 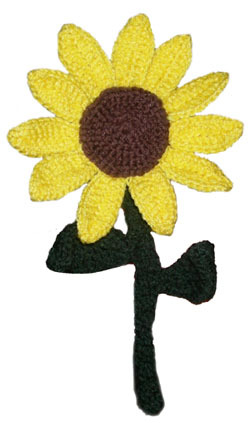 Here are the instructions to crochet this sunflower! Using photo as a guide, sew petals to edge of center with a yarn needle. Using photo as a guide, sew stem to back of center with a yarn needle. Optional: While sewing stuff only the top of the stem, behind the sunflower with fiberfill to create a cone shape. Using photo as a guide, sew leaves to stem with a yarn needle. Optional: Insert wire into stem of flower for stiffness. If you need help with this pattern, just leave a comment! For more flower patterns, visit the Crochet Spot Store. This entry was posted on Friday, February 27th, 2009 at 7:19 AM by Rachel Choi	and is filed under Free Crochet Patterns. You can follow any responses to this entry through the RSS 2.0 feed. You can leave a response, or trackback from your own site. Hello from Thailand. Such a very long distance from you, right? I really love the way you share your funtastic patterns and I really love crocheting, too. This is the first time I post my comment but, definitely, I will come again very soon with my first sunflower (following your instruction). Wow, all the way in Thailand, that is very far. I’ve never been there before! Thanks for your wonderful comment. I hope you sunflower turns out really good! I loved your sunflower so much, I’m posting your website to my blog this week. Thanks Robin! I just checked out your blog and it looks great! I tried to subscribe to your newsletter, but was unable to open the confirmation site. Thanks for letting me know! Is it the part where you put your name and email in the orange box that isn’t working? Or the link in the confirmation email? I love all of your flower patterns. My favorite flower is a Gerber daisy. Have you happened upon a pattern for that particular flower? If so, that would be awesome. I just love your site.. It’s so helpful.and lots of new ideas.. Your ideas and patterns are very much appreciated..
Hi Carmen! I don’t know Spanish or the initials for Spanish in crochet. Maybe there is an English to Spanish translator that you can use online. Rachel I have search the web for a sunflower to crochet and by far yours is the nicest and brightest I have seen. Yes, it does seem to be smiling at me! I to forgot to say THANK YOU! I have an old high school buddy who helped me after my heart failure. She grows daylilies. I would like to crochet her a daylily or a bunch of daylilies to begin to thank her for all her support. Can you or one of your members help me with this? I tried to use your sunflower pattern and experiment – it didn’t even look close to a sunflower. :-). Gigi, I wouldn’t use the sunflower pattern to make a day lily. But if there is a part of the sunflower pattern you need help with to make the sunflower, let me know and I’ll try and explain it to you further. Hi Becca, I just updated the pattern to make it more clear. Let me know if you still need help. Thank you for all you do for us! You are a very giving person and I especially love the charity projects. Best of luck to you in 2010, your site is amazing. Will send you my success with the sunflower – must get a vibrant yellow!!!! I’ve just made your sunflower and it’s lovely! I actually made 2 lots of the center, petals and leaves and then sewed the individual parts together stuffing with toy filler as I went, it’s really effective 3D sunflower! It’s meant to be a gift for someone but I’m going to have a hard time persuading my 2 year old to part with it, lol! Leave me an email address if you want me to email you a photo! On Row 2 of the petal, am I supposed to be working into the opposite side of the foundation chain, or back along the top of stitches in Row 1, please? 2. join yellow to centrepiece, work Rows 1 and 2, then slip stitch back into the centre piece to secure petal, then work (maybe) another slip stitch and repeat all the way around? join yellow to centrepiece, work Row 1, slip stitch back into centrepiece to secure petal, then work Row 2. This would mean yarn is now at the outer edge of petal, so would need to slip stitch back down side of petal to get to the centrepiece again, ready to work next petal? Hope that makes sense – trial and error methinks! Getting married in June and having Sunflowers and blue bonnetts. This is the prettiest pattern i have found so far (that i think i can do anyway) Wish me luck!! I love sunflowers and I make pillows with all left over yarn and I cannot tell you enough how much I love this pattern. easy to make I had no problems at all. thank you so much for sharing this with me. Hi Pat, yes, the petals and leaves are each made separately and then sewn together.